Psychology Camp: Camp Comm Recruitment NOW OPEN!!! Hello Everyone! The most exciting camp in NUS is recruiting. Sign up now! We hope you have been getting along well this semester. 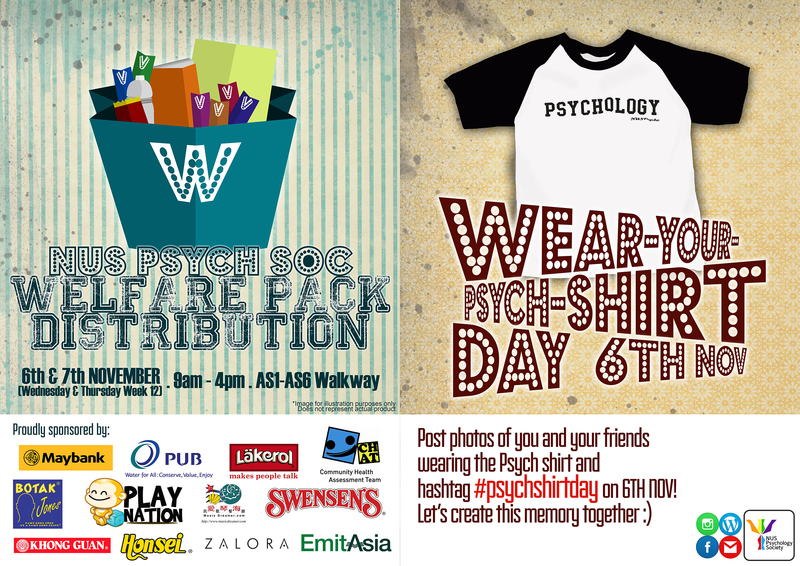 Our biannual Exam Welfare Pack Distribution for all members of NUS Psychology Society and Wear-Your-Psych-Shirt Day is back! Simply present your membership card to collect your welfare pack at our booth along AS6 Walkway, tables 20 & 21, on 6 and 7 Nov, 9am – 4pm. If your friends are interested, they can sign-up on the spot to receive a welfare pack and membership card along with other benefits. A lifetime membership costs $5. Do come to collect your welfare packs while stocks last! We look forward to see you there! THE BAZAAR by NUS Psychology Society!!! 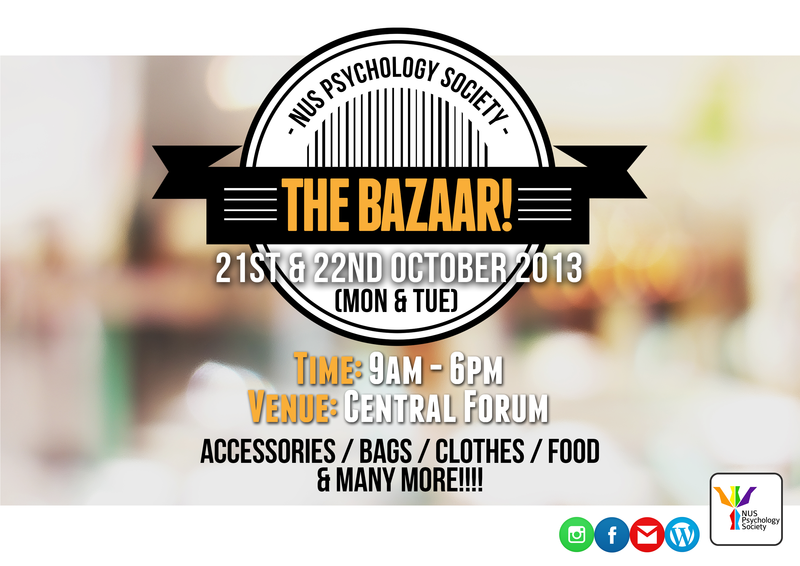 THE BAZAAR by NUS Psychology Society is back!!! Come join us at the Central Forum on 21st & 22nd OCTOBER 2013 from 9am – 6pm! A wide variety of items such as Apparels, Accessories, Bags, IT accessories, Board Games and many more can be found at the booths! As you all know, NUS Psychology Society has undergone a change in its Executive Committee and we are happy to say that there are many things to come in the upcoming weeks and semester for all our members. For the past week, you may have seen several teasers hinting at revamp of NUS Psychology Society and today, on the 10th October 2013, we proudly unveil a whole new look for all of you! Secondly, NUS Psychology Society is now on Instagram! This new social platform would capture all the wonderful moments we share together as NUS Psych Soc members during all our events and also inform you first-hand on what is to come! Also, learn more fun facts of Psychology through photos which we will put up every now and then. So follow us today @nuspsychsoc! Lastly, do look out for an upgraded look of our new noticeboard located along the AS1-AS6 walkway for event updates and other interesting things to come! Like our Facebook page (which also has a new look) TODAY! Following this major revamp, our bazaar is also coming up on the 21st and 22nd of October so do come down to the Central Forum from 9am to 6pm on both days to shop! We thank all of you for your support and see you all soon! Welcome to the official website for NUS Psychology Society! Are you one of our members? If not, we hope that you would join us soon! We gladly welcome all NUS students, regardless of their major, into our society. The society is a student-led body that strives to promote the well-being of our members. We organise a variety of events throughout the academic year to look after members’ academic and non-academic needs. Welfare pack distribution, Wear-Your-Psych-Shirt Days and academic-related tours are some activities you can continue to look forward to. Apart from carrying on with established events, the 8th Executive Committee would further utilise feedback channels and suggestions from members to adapt and streamline our existing events to better cater to our members’ welfare. In this new academic year, we also strive to further engage our members by offering ad-hoc event-planning positions. Through this, we hope to enable our members to gain valuable experiences while allowing the committee and the members to get to better know each other. For instance, sub-committees can be established for welfare, publicity and Psychology Camp. Please let us know your interest by either emailing us at nuspsyche@gmail.com or by approaching anyone of us in school. Trust us, it will be a meaningful journey and experience! Psychology Society also intends serve as a bridge between Psychology majors, alumnus and the Psychology Department so as to foster a cohesive community amongst them. As such, we would hope to see all of you at our events, so that we can get to know each other better. Please continue to support us this new academic year and do offer us your valuable feedback and suggestions by sending an email to nuspsyche@gmail.com or by approaching any of the friendly committee members. We wish you all the best in this academic year. Come join us as a student vendor and have the opportunity to run your own shop on the 21st & 22nd of OCTOBER 2013 at Central Forum. Simply invest $60 per booth for 2 days and you can get to keep ALL your earnings! Students who are interested, do email us @ treasurer@nuspsyche.org with the details as stated by 22nd SEPTEMBER 2013.